When it comes to exploring uncharted territories, we’re pretty limited by the tech that can get us there, whether it’s the dark and highly pressurized ocean depths or far-off planets and moons. Despite the lack of warp drives and transporters, NASA is hard at work to push the technological envelope and keep our opportunities for exploration open. This little guy is named RASSOR, which is obviously pronounced “razor” and equally obviously stands for “Regolith Advanced Surface Systems Operations Robot.” Regolith is a fancy geology word for dirt, and RASSOR is designed to autonomously drive around the Moon and scoop up dirt with those toothy drums. The entire robot only weighs about 100 pounds, but it can haul up to 40 pounds of dirt. The idea is that RASSOR would be sent to the Moon along with a larger lander, and then autonomously rove around 16 hours a day, pouring loads of dirt into a processing plant on the lander which would extract water, hydrogen, and oxygen from it. Let the system run for long enough, and we could head to the Moon knowing that there’s a nice big pile of water, air, and rocket fuel waiting there for us. Read the full article at IEEE Spectrum. It’s hard not to have your imagination piqued by images of terraforming robots and space colonies! Do you think space robotics will one day become a sizable part of the industry? What private companies do you know of that are working hard on aerospace applications? In a new RIA article, Bennett Brumson looks at how application influences the interplay of design and software architecture for industrial robots. He talks with industry pros about how the needs of the user influence design — and how that will affect the future of industrial robots. The software architecture of industrial robots, the “brains” of an automated work cell, enables the robot to perform assigned tasks quickly, repeatedly and accurately. As computing power increases and software becomes more sophisticated, robot design architectures evolve to keep pace while maintaining robotics’ inherent flexibility. Read the full article at Robotics Online. Want to learn more about robot architecture? Sign up for RIA’s free webinar — “Robot Design, Integrated Controls & Software Architectures of Industrial Robots” on Feb. 28 at 12 noon EST. And don’t forget to leave your thoughts on our website at the end of the article! Read the full article about Liam’s 3D printed robotic hand at Tech Crunch. It’s pretty amazing that technology has made something possible that just a few years ago would have been science fiction. What other amazing advances in technology, medical or otherwise, have you seen recently? That may be true of making stuff, but a lot of jobs left in the world for humans are service jobs. I ask Brooks to walk with me through a local McDonald’s and point out the jobs that his kind of robots can replace. He demurs and suggests it might be 30 years before robots will cook for us. “In a fast food place you’re not doing the same task very long. You’re always changing things on the fly, so you need special solutions. We are not trying to sell a specific solution. We are building a general-purpose machine that other workers can set up themselves and work alongside.” And once we can cowork with robots right next to us, it’s inevitable that our tasks will bleed together, and soon our old work will become theirs—and our new work will become something we can hardly imagine. Read the full article at Wired. What do you think of Kelly’s conclusions? What new tasks do you see us delegating to automation? How will the proliferation of robotics expand our own capabilities? It’s easy to tell when a new technology has reached critical mass – discussions over its long-term effects start kicking into overdrive. That’s happening now with robots and how they are going to affect the human job market. Conventional thinking has always held that automation and robots have historically been good things, because when a machine takes over a task, the human who used to do it is forced to do something smarter and better. This has had traditional repercussions both great and small, from auto assembly line workers necessarily having to upgrade their skills or maybe even start their own businesses, to regular people simply not having to remember minutiae like phone numbers because machines do it for them. Machines have traditionally freed our brains to worry about other, more important stuff. Wired writer Kevin Kelly, on the other hand, takes a more optimistic approach when he says that we can’t even imagine the jobs we’ll create because of this increasing automation. 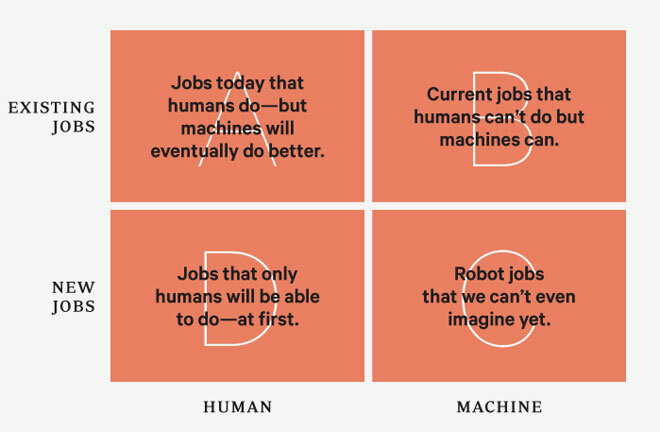 Humans’ role in the future will thus be the same as it is now: to create jobs that only people can do at first, with those tasks eventually falling to machines, whereupon the cycle will keep repeating. Read the full article at Macleans. What are your thoughts? What sort of highly-automated world can you imagine? What sort of creativity will we employ as we start creating new jobs? Lat week wrapped out a successful 2013 Automate Show at McCormick Place, Chicago. Automation industry leaders gathered not only to show off their latest and most advanced tech, but also to talk about how automation is beneficial for companies of all sizes and how — for some of them — automation has saved their businesses. To buttress its claim that automation is not a job killer but instead a way for the United States to compete against increasingly advanced foreign competitors, the industry group reported findings on Tuesday that it said it would publish in February. The federation said the industry would directly and indirectly create from 1.9 million to 3.5 million jobs globally by 2020. The federation held a news media event at which two chief executives of small American manufacturers described how they had been able to both increase employment and compete against foreign companies by relying heavily on automation and robots. Also making the case was Drew Greenblatt, the widely quoted president and owner of Marlin Steel, a Baltimore manufacturer of steel products that has managed to expand and add jobs by deploying robots and other machines to increase worker productivity. Read the full story at the New York Times. Did you attend the Automate Show? What were your favorite take-aways? The 2013 Automate Show closed yesterday, with preliminary reports of a 40% increase in attendance from the 2011 show and good feelings from exhibitors all around. The Automate Show also allowed the robotic and automation industries to voice their success stories to the press, who’ve recently been focused on a negative portrayal of robotics. Here’s a glimpse of several live demos at the Automate Show from the New York Times. And who’s faster? Man or machine? An Automate attendee has a little fun at the Adept Technology booth. Thanks to the staff of A3, the exhibitors, and everyone who worked hard to make this year’s Automate Show a success. We’ll see you all again in 2015!